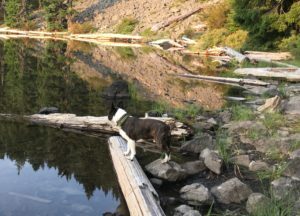 Gregory S. Lamb – PDX Author | My Novels: "The People In Between" and "A Dangerous Element"
A couple of years ago, a friend shared with me his notes about a secluded lake with a trailhead about an hour and a half from my home. 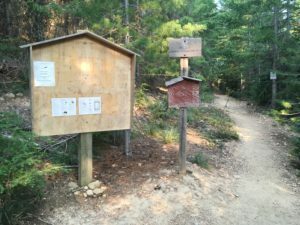 I couldn’t locate the place on any map in my possession but with the notes I had, I was pretty sure I could find the trailhead. Preparing and leaving was a simple matter, I keep nearly all my backpacking gear handy and packed. I added a couple packets of freeze dried meal fixings from a large stash I keep around, measured out some kibble for the dog, added some herbal tea bags, packets of freeze dried coffee, filled a water bottle for the hike in (I usually filter the water I’d consume from a local source), and tossed everything in the back of the car. I asked my furry little buddy to hop in and off we went. Once we were off the main highway, we only saw one other vehicle, headed the opposite direction. Less than 2 hours after leaving Portland, we arrive at the trailhead. It was a Wednesday afternoon in late summer and no other vehicles were parked at the trailhead. Not a soul or sound in sight or within earshot either. Only a few smudged footprints were visible in the pine dust when we started the short trek in. The trail itself isn’t very long or difficult. 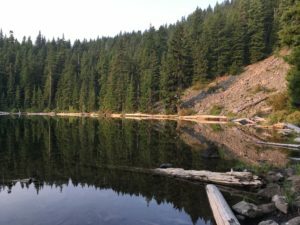 In my experience, these types of hikes usually lead to places filled with remnants of young people’s outdoor parties and all that goes with them – trail trash, beer cans, fire pits with partially burnt refuse etc. But…this was different, totally and unexpectedly peaceful, clean, and pleasant. I suspect only a few people have even heard of this place and those who know of it, respect it and “leave no trace” of their visits. With my dog Matisse leading the way, we contoured around to a shallow ravine where we could hear the sound of Green Lake Creek cascading down the draw to the White River 5 miles below. I carefully stepped across some large stones in the creek, keeping my feet dry while Matisse slogged across slurping while rehydrating himself. Most of the trail wound along the contour with a couple of detours around recently fallen timber from the previous winter (lots of fallen trees everywhere – this past winter provided the north cascades with a particularly heavy snow). To my great surprise, we arrived on the lake’s shore at about 3:00pm. The only sounds came from a raptor hiding in the high branches of one of the many pines lining the lake. Between the large bird’s infrequent squawks was the rhythmic sound of wavelets lapping the deadfall along the shore accompanied by the buzz of aquatic insects dancing over the lake’s surface. I thought that maybe since it was still early there might be some late arrivals – maybe even a large group. With that possibility, we decided to pitch camp and take in the peace and quiet for as long as possible. I used to have different gear for back packing. Most of my stuff was ’70s vintage and reliable, but also bulky and heavy. I’ve also discovered that at a certain human vintage (mid-’50s) one can hike faster and farther with less weight. I’ve since ditched my old gear and acquired some pretty nice lightweight and durable equipment that makes my outdoor adventures even more rewarding. In all, my entire outfit weighs in at less than 25 lbs. That includes hiking poles (double as shelter frame), hammock (I use it as a lounge chair mostly), and ukulele (my 22 lb banjo would blow my entire pack light strategy). With my current arrangement it takes about 10 minutes to set up or strike camp. By 6:30 pm, the sun cast a long shadow over the lake and as it sank below the west ridge, caused the water to go still. I prepped some kibble in a collapsable bowl for my dog, then set about making dinner for myself. The Jetboil stove had 2 cups of water boiling inside of 45 seconds. This I poured into a pouch of Beef Stroganoff, which I stirred and resealed in order for it to rehydrate for about 20 min. I then filtered some more water and boiled it up for tea. It wasn’t a gourmet meal, but in the out of doors, everything tastes good. With sunset, I determined we’d be the sole residents of this wonderful secret spot in the North Cascades. I thought this kind of solitude could only be achieved in the off-season, but I was rewarded with the unexpected. Morning unfolded in reverse order with peaceful solitude prevailing throughout the entire experience. I’ll be heading up to Catalpa Lake again in a couple of weeks – on a Wednesday afternoon for sure. McNamara’s surf memoir is a worthy read if only for the fact that he was the first to conquer surfing a 100 ft wave. This work chronicles McNamara’s life from childhood through the present. With respect to non-fiction memoirs written by prominent personalities from the surfing world, I make it a point to read them all. Unlike other athletic pursuits, surfers rarely take time to write about their sport. 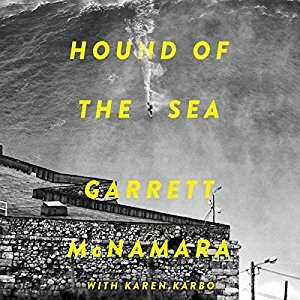 Hound of the Sea is a story written by a surfer for surfers. The title is a reference to the author’s Celtic surname meaning “hound of the sea”. Unlike Finnegan’s Barbarian Days and Duane’s Caught Inside, McNamara’s story doesn’t come across as a literary, colorful, masterpiece of prose. Nearly all the chapters are 5-6 pages long that address specific milestones or memorable moments in the author’s life. The first 77 pages seemed pretty unremarkable at first, but later it was clear how the early non-surfing years of the author’s life gave shape to his life goal “To Keep Surfing”. What I really enjoyed about reading this book was the honesty and mater of fact transparency the author so humbly offers to anyone interested in really knowing what it is to walk in his shoes (or more appropriately his flip flops). Among the elite few who’ve ever surfed “Jaws,” “Teahupo’o,” “Mavericks,” or “Cortes Bank” to name a handful of monster big wave spots, at one point or another, these surfers all discover that what they do in the water is like living in a fish bowl. The chapter titled “Incident at Cortes Bank” is one example of how the opinions of non-witnesses and media could really crush a person’s spirit. This was a really important passage and I’m glad McNamara chose to include it. What I didn’t enjoy reading about was the cavalier attitude toward including marijuana and other drugs in the surfing lifestyle. True as it may have been for McNamara, it is sad and disappointing to be reminded that not every surfer (even those who are tremendously accomplished) is a clean living, serious athlete. In the end, what worked for me as an admirer of Garrett McNamara was the “blue print” he developed to become the kind of serious big wave rider who is worthy of historical recognition. In the realm where McNamara operates (riding enormous killer waves), one cannot imagine how these surfers are able to keep fear in check. In his words, brief and concise, on page 219, McNamara says, “Fear is something we create, because we’re stuck in the past or envisioning the future. If we stay in the present there is no fear.” Coming from a man who’d endured the physical trauma of having his body tortured from the thousands of pounds per square inch and being pounded on reefs countless times, there is no question that Mr. McNamara has the credibility to speak to fear. When I heard about Mr. Finnegan’s memoir, chronicling his lifetime of surfing adventures intertwined with his journey as a writer, I knew it would be one of the best books I’ve read. Readers who have never surfed a wave or had any interest in the surfing lifestyle will still find this work well worth reading. Finnegan has a knack for smooth beautiful writing that will evoke emotions both familiar and otherwise. This memoir is more than a story of one man’s life’s journeys and adventures. It is an exploration of what it means to be devoted, almost entirely to a way of life. With Barbarian Days, Finnegan created an avenue for the non-surfer to become immersed in what a relationship with the ocean is all about. As a surfer, William Finnegan could likely be counted among the very few who have surfed many of the best, challenging waves that the world’s most exotic locales have to offer. One of the later chapters that I found captivating was the author’s experiences with San Francisco’s “Ocean Beach”. Having grown up surfing on that stretch of coast, the winter swells at VFWs, Noriega, Sloat, and Fleishackers, is still considered something a surfer must work up to. These aren’t places a casual surfer can handle, even in perfect conditions. Finnegan offers an honest, unblemished portrait of the Ocean Beach experience without any need for embellishment. Conquering the winter waves at Ocean Beach is an extremely difficult endeavor that only an author with Finnegan’s experience and credibility can illustrate with integrity. As a reputable writer, William Finnegan is proof positive that it is indeed within the art of the possible that a great surfer can at the same time be a great writer. I rarely read anything twice – If I am interested in a piece of fiction or a non-fiction work, I’ll take my time while reading so I can deeply digest and reflect on every aspect of content. While engaging in a writing project with the theme “Wind and Water”, a spark of nostalgia hit me and inspired me to re-read Dove, by Robin Lee Graham. I didn’t remember that it was a particularly well written account of his exploits as a boy sailor who circumnavigated the globe solo in his 24 foot sloop, returning as a man 5 years later, but still his story remained in the back of my mind. When I re-read Dove, I discovered that indeed it was surprisingly well written, given the age of the author. Clearly Graham’s work with Derek Gill had something to do with the outcome, but the real work was accomplished by an extra-ordinary young man who challenged the elements. As one who’s read nearly everything on the topic of solo sailing adventures, I questioned why this one was so different than the others. For me, the answer was that Dove did not include extensive passages detailing the work and procedures involved in maneuvering and navigating a small boat across oceans. Graham’s account was more about the personal journey and the love he found while experiencing humanity in all its diversity. I read “Dove” shortly after it’s initial publication arrived in our local library. I was thirteen years old and entranced by what I’d read. This unique “coming of age” non-fiction account, inspired me along with hordes of others to pursue the kind of adventure that Robin Lee Graham wrote of in “Dove”. For both blue water sailors and those dreaming of such experiences, this story and the movie that followed, is to sailing, what “A River Runs Through It” and its movie, is to fly fishing. I have no doubt that global blue water cruising had increased in popularity as a result of Graham’s voyage and his subsequent book that reads like a classic coming of age novel. After all these years, and having read nearly all the other books written by globe trotting sailors, a spark of nostalgia for those days in the early ’70s inspired me to read it again. I’m really glad I did, because this one stands out among all the others. Not because it was one of the first of its kind, but because Graham made it personal. His account was of a boy coming of age during an extraordinary adventure in both idyllic and life threatening situations – all before the age of GPS and real time communications. If you’re a fan of coming of age literature or have an itch for armchair travel, this story will do more for you than satisfy the itch. It will inspire you to get out there and test yourself and perhaps discover true happiness. The book’s description on Amazon was more than enough to convince me to order a copy. I read the preface as soon as it arrived and wasn’t able to put it down until reading the final, evocative pages of the epilogue. Having grown up in the S.F. Bay Area, and traveled/surfed the same stretch of coast in the ‘70s that Duane writes about, I can attest to the honesty and authenticity of this wonderfully crafted piece of non-fiction that answers so many questions about the lure of the world’s greatest sporting adventure. This book is everything it should be and more. Duane’s style and delivery has a poetic touch that deviates from the stodgy conventions of other work I’ve read in the memoir genre. Every passage is written with purpose and with words that stimulate all of the senses. From the descriptions of the Santa Cruz cliffs overlooking Steamer Lane up toward Natural Bridges, 4 Mile, Scott and Waddell Creek and on up through Davenport and Pescadero, Duane took me on a ride that reminded me of everything I love about that stretch of coast. The smell and taste of thick salty early morning Pacific fog and the muffled sound emanating from the lip of a heavy glassy wave smacking into the flat water came to mind. Reading along in the warmth of my living room, the cold and camaraderie of surfing with friends in a secluded spot, away from the crowd, also conjured emotions of nostalgia. Duane’s relationship with the people in the community of Santa Cruz and those he surfs with ring true and offer insights recognizable by anyone who’s ever surfed California’s Central Coast. Though local surfers probably might not appreciate it, Duane’s story might just be the lure for others to come and experience the region. Additionally, interspersed in each chapter are snippets of well researched history about the people who’ve brought surfing to the forefront over the preceding century. Along with references to the testimonies of the observations about surfing from explorers, missionaries and likes of prominent figures like Mark Twain and Jack London. Tales of some of surfing’s greatest personalities are also included (e.g. Greg Null and the legendary 50’ wave ridden at Makaha). Duane also provides easily digestible explanations of the technical details of wave physics, influences of weather and tide, and surfboard design, all of it contributing to the subtle complexity of what it is to be a surfer. For anyone who’s ever roughed the wax on their board with a handful of sand before paddling out, or anyone who’s ever been held down in dark cold Central California water by a second wave in a set, Caught Inside is a must read. Others should read it for the pure beauty of place and Duenes’ exquisite writing. Last month I posted a short piece introducing the collaborative project I’m involved with as one of the Interesting Authors. This month, we’ve expanded our reach by establishing the Interesting Authors Blog. Since each of us already has a personal blog (for me it is this one), we thought we’d try something different. Each of us posts something on different days each week. It can be anything, but we aren’t selling a service, we aren’t marketing our novels, and we don’t have any links on the blog for purchasing books and novels. What we do have are some interesting posts. Does having a blog serve as part of the Interesting Authors marketing strategy? Maybe, but we think it could become something more – a place to interact with people who aren’t shy about about expressing their opinions about interesting topics. For some of us it serves as another opportunity to write on topics appealing to a different audience of readers. One of my objectives is to develop a monthly theme so that each of my posts conform to a loose structure. Other contributing authors are taking a different approach. In fact one of them is challenging the broader audience to participate and do some writing of their own. If you’re reading this you’ll definitely want to drop by the i.a. blog. As we approach the close of 2015 and with the holiday season well underway, I thought now would be a good time to shout out about the top five books I read this year. Since I didn’t plug a “top 5” for 2014, I’m going to stretch and add a few to a separate list. Bound for Distant Seas – by James Balwin. Read my review and author interview here on this blog. Levant Mirage – by Oliver Chase. See my review. Relic II – by Jonathan Brookes. See my review. The Opposite of Hollywood – by Margo Perin. See my review. The Boys in the Boat – by Daniel James Brown. This was a work of what I’d consider the best in the non-fiction genre. See my review. I thought these two collections of poetry were among the most enjoyable I’ve read: The Hundred Year House – by Michael McDowell. I reviewed this collection and posted an author interview. Another collection equally enjoyable was, We Walk Alone – by Mariah E. Wilson. The author graciously granted this interview. I hadn’t read anything as good in the genre of experimental literature since the early ’70s when Ishmael Reed wow’ed me with The Last Days of Louisiana Red. My appetite for edgy writing is once again fulfilled. This excellent story about “when jets were young” is a must read for anyone who’s ever flown a combat jet. See my review. By far this is the best debut novel I’ve read in decades. I found it emotionally gripping with a strong theme. The author also has a rare talent for presenting vivid place descriptions. My review may encourage further investigation. #1 My top read for 2015 might just be among the very best for this decade! When Women Were Birds by Terry Tempest Williams. I discovered this short piece of non-fiction while listening to a public radio interview about the author. It is a work unique among those in the memoir genre. I was deeply moved by the words. See my recent review to get a bigger feel for what you’ll miss if you don’t read this lovely work. Daniel James Brown knew what he was doing before he set out to write this highly entertaining and interesting piece of non-fiction. In fact, for me it will likely go down as the best I’ve read in this decade. In past decades, among the best that gripped my attention and tugged my emotions, I’d say that “The Perfect Storm” was the story of the ’90s, and for me, “Zeitoun” ranks near the top for those written at the turn of the century. 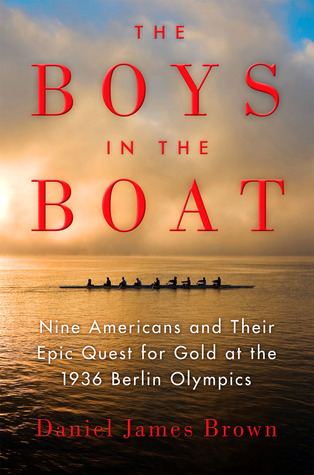 “Boys in the Boat” rivals anything I’ve read this decade and suspect it will be a top contender for the best in the ten years of non-fiction I’ll be reading between now and 2020. – The characters, all real people with a history of their own. From the coaches, the boat builder, and the entire crew, not just the 9 that represented USA in “Eights” at the ’36 Olympiad, but their families, the coach and crew of their rivals at Cal, and the political opponents in Germany during that era. Brown delivers a well researched and meticulously crafted narrative that takes the reader on a blow-by-blow ride into the world of the common oarsman who achieved the uncommon during a period in history that shaped the world we live in. As I read, I found myself riding the roller coaster ride between laughing, riveted at the edge of my arm chair, and wiping the tears from my eyes as a result of the emotion the author managed to evoke by presenting readers with authentic stories that would resonate with anyone with a heart. Stedman’s debut novel is a compact study in highly charged emotions evoked from strong images of a bygone era. The author’s place descriptions and talent for developing unique voice and perspective drawn from each character’s point of view made me a captive reader from the first pages. Stedman hits on a theme that resonates across ages and oceans. When a person has the best of intentions and is able to rationalize why a bad idea can be good, the consequences will often catch up. Stedman’s main characters, Tom and Isabel present us with just such a story. 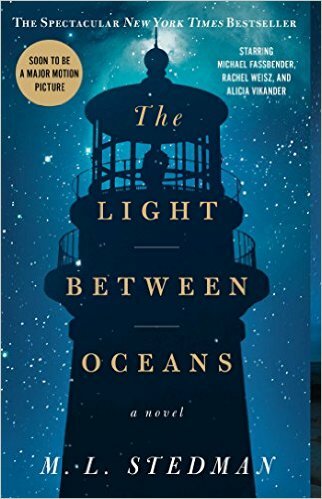 Tom, a veteran of the trenches during the Great War returns to shore from his isolated vocation as a lighthouse keeper. He meets Isabel and is awakened again to the the possibility of experiencing a happy life. What plays out on Janus Rock, the location off the coast of a West Australian port, turns out to be a tragic end to happiness in the lives of more people than Tom or Isabel could have imagined, including their own. I found Stedman’s writing craft to be “top drawer.” This author’s ability to evoke emotion and thought from a reader is a rare talent. I’ll be including this one as one of my top 5 read this year and likely among the top 5 for the decade – we’ll see. There are still a few years remaining in this one and Stedman might just pull hat trick and wow me with another extraordinary novel.